Hitting a golf ball is a good example of applying force vectors. When you hit a golf ball squarely, it should fly horizontally and on a slightly vertical path, as well a having a backspin, depending on the face angle of the golf club used. Hitting the ball with what is called an open face will provide an extra spin that makes the ball slice to the side. Hitting with a closed face causes the ball to hook in the other direction. the direction of motion of the club head determines the direction of the force vector. This vector can be broken into two perpendicular components that determine the direction of motion of the ball and its spin. 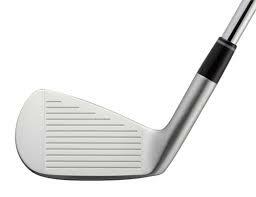 Golfers can use golf clubs with different club head angles to vary the vertical direction as well as the spin. They can also adjust the way they hit the ball to change angles and spin. What is the impact force? What are the component vectors? What is the result of the impact? What are some golfer applications? When swinging a golf club, the golfer wants to apply a force on the golf ball that will propel it in a specific manner. The impact from the force of the golf club is broken into perpendicular vector components. The main force component goes through the center of the golf ball, The other force component is parallel to the club head. The golf ball is propelled in a direction from the point of impact through the center of the ball. The other perpendicular component of the force causes the ball to spin due to the friction of the ball on the club head. Dimpling of the ball and groves in the club head facilitate the spinning. A golfer might use a 8-iron or 9-iron that has a steep inclination angle, thus causing the ball to be propelled in a high arc and having a backspin that would prevent the ball from rolling after it hits the green. Golfers use a driver that hits the ball more flush, resulting in a lower trajectory. Some golfers can adjust their swing to cause the ball to have a topspin, such that it will roll further. Golfers can also hit the ball with an open or closed swing, as opposed to hitting the ball squarely, as in this illustration. Some golfers use an open club face when they hit the ball, as a way to cause it to slice. Others slice the ball because of a poor swing. When you hit a golf ball, the direction of motion of the club head determines the direction of the force vector, which can be broken into two perpendicular components that determine the direction of motion of the ball and its spin.